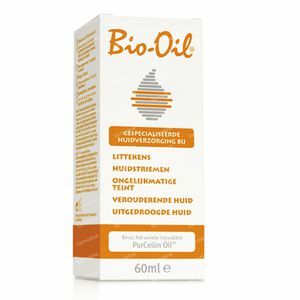 Bio-Oil Recovering Oil Introductory Offer 60 ml order online. Bio-Oil iRecovering Oil s a specialist in skin care product that helps to reduce such scars, stretch marks and pigmentation. Its unique formula contains the revolutionary ingredient PurCellin Oil that is highly effective against aging and dehydration of the skin. The product is suitable for use on both face and body. Bio-Oil helps to reduce the visibility of both new and old scars caused by such operations, accidents, burns or insect bites. Moreover, it is very effective for the preservation of the elasticity of the scar tissue. Younger scars have a good chance of improvement within a shorter period, older scars have also benefited from the skin to improve elasticity. Bio-Oil is very effective in reducing the visibility of existing stretch marks, also helps prevent new stretch marks by increasing skin elasticity. The faster Bio-Oil is used, the better the result appreciably thereafter. Scars: Bio-Oil 2x a day applay on the scar and massage with light circular motions with your fingertips till the product is completely absorbed. Stretch marks: Bio-Oil 2x a day apply to the skin and massage the stretch marks with light circular motions with your fingertips till the product is completely absorbed. To prevent stretch marks, massage 2x a day from the second quarter on the abdomen, breasts, hips, buttocks and thighs. Thanks to the reinforcement of the natural oils from the skin, it remains elastic and the risk of stretch marks is smaller. Use Bio-Oil for a minimum period of 3 months. The Bio-Oil formula is a combination of plant extracts and vitamins in an oil-based suspension. Since oxygen free oil, it leaves the plant extracts and vitamins to maintain their potency. Bio-Oil contains the breakthrough ingredient PurCellin Oil ™,. This transforms the general consistency of the formulation so that the product is light and not greasy. This ensures easy absorption through the skin of the beneficial substances present in the vitamins and plant extracts. Fab produkt to help any scar to heal . I have used it after burn marks from the cooker, but also for my daughter . She scratches a lot and it helps the skin to heal. Very effective oil, soft structure, absorbs well. Softens the scar. Ideal for sunburn.